The Calendar window can be sized to display up to 12 month (any width/height ratio). The month range can be shifted step by step. Click on month or year caption to select any month or year. Quick toggle: full year / personal layout. 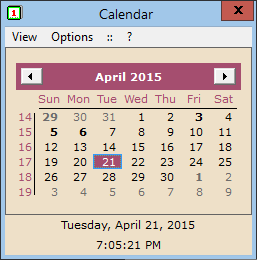 The selected date (first button) or the current date and/or time (second button) can be copied to the clipboard. 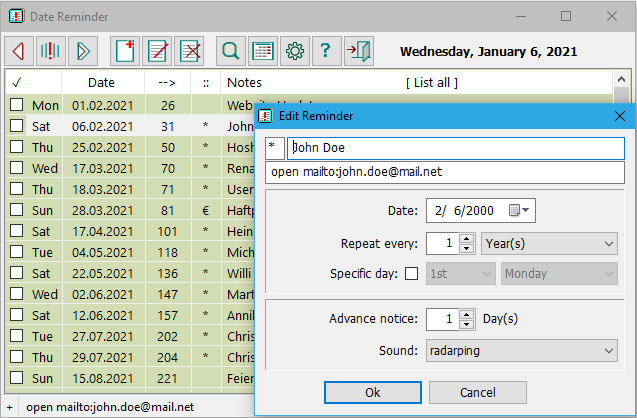 The date/time formats are selectable by menu (right mouse click on buttons offers two default formats each; up to 10 custom formats can be assigned in the INI file). The default date/time formats and the month/weekday names will show according to the user's regional settings. Several language files are supplied for the menus (Unicode support). * User selected fonts and colors are not supported by Windows 7/8/10, unless you select XP style month boxes (see image). The INI file is stored in the program folder by default. A different directory can be specified in the shortcut properties. No entries are made in the Windows Registry. "Holidays", annual events or sports events, for example, are defined in tables (*.ann files, several files are supplied), and can be activated individually or combined. The dates will be highlighted; details available on right mouse click. TimeSync gets the current time from a NIST server, and adjusts the PC clock if necessary. Although the exact time is also supplied by Windows or (probably) by your router, you may want to have an extra tool that checks the time at your will. Time and date are displayed according to the user's regional settings. Accuracy is usually within a second. TimeSync will try alternative servers, in case the time cannot be obtained from the preferred server. Option /auto is provided to run TimeSync from the the Windows task scheduler. In this mode the TimeSync window will not show if the clock deviation is under a given minimum. Several language files are available. In clock display mode the background is either fully transparent (only visible on mouse hover), or permanently visible as a semi-opaque rectangle (see settings). Double click switches between pure clock and control panel. 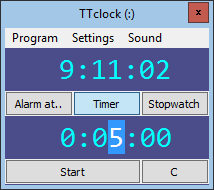 When started TTclock makes sure it will show within the desktop bounds. On alarm the control panel is brought to the foreground. TTclock does not show in the task bar, but keeps an icon in the system tray.